The West Hill of Woodcliff Lake! 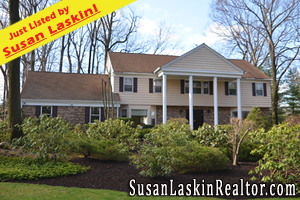 Woodcliff Lake Real Estate from Susan Laskin, Your Bergen County Realtor! 57 Springhouse Rd in Woodcliff Lake ($998,950!) is an expansive Center Hall Colonial w/updated Kitchen & Baths and boasts a superb location w/ an exquisite property on the sought after Hill of Woodcliff Lake! Inside you find an immense Center Hallway which opens to the front to back Living Room & wonderful Formal Dining Room, an updated Center Island Kitchen w/magnificent wood cabinetry & granite counters that leads to the oversized Family Room w/fireplace, and a a Fifth Bedroom & Full Bath that have a private location on the Main Level. There is also an updated Powder Room is located off the Family Room. The Remarkable Master Suite has a large Master Bath & Water Closet, plus large walk in Closet. Each of the remaining 3 bedrooms on this level are incredibly spacious. The Updated Main Bath is located off the spacious Hallway..The Basement is finished w/ a Recreation Room, Exercise Room, Pool (Table) Room, & ample storage. With a paver driveway, banquet sized rooms and updates that will surely entice you, this home had tremendous value! Looking for more Woodcliff Lake Real Estate? Browse through my Feature Homes! Some incredible homes across the wonderful Bergen County towns!